Like the Kalman filter, the Extended Kalman Filter (EKF) operates on Gaussian distributions. However, where the Kalman filter requires its action and sensor models to be linear systems, the EKF can use models based on non-linear systems. The motion model for a differential drive robot defined in part one of this series is an example of a non-linear system. The EKF linearizes the non-linear system around the current state. The graph below demonstrates this process. The blue line represents a non-linear path over time. 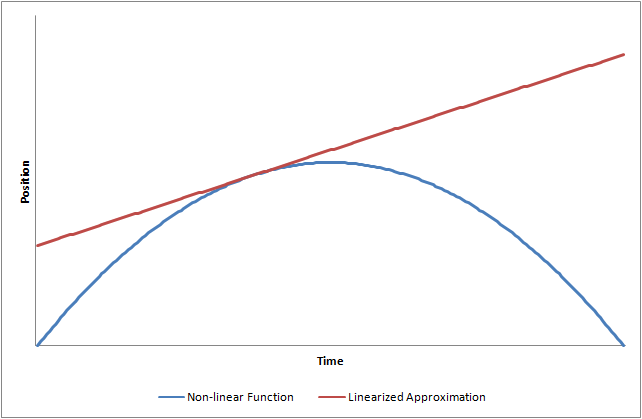 The red line represents a linearization of the non-linear path at a single moment in time. The error between the non-linear function and the linearized approximation grows as the distance from the linearized point grows. EKF uses a state type X and an action type U. The action model transition function defines xposterior = g(xprior, ucurrent). This non-linear function is linearized by taking the gradient, or Jacobian, of this system. If the prior has a non-zero covariance, then that error is shaped by the Jacobian of g with respect to X. If the action has a non-zero covariance, then the action covaraince is shaped by the Jacobian of X with respect to U and added to the posterior covariance. It is very common for the action to be treated as a perfectly known value and a constant error value is relied upon to expand the probable range of the posterior. A Kalman filter can be converted to an Extended Kalman filter by changing the values of A and B before every update. An Extended Kalman filter that operates on a system that is actually linear is identical to a Kalman filter. If we were to build an EKF using the PoseChange and linear system defined in the previous tutorial, we would end up with a Kalman Filter. As in the Kalman filter, each point in the prior state belief is transformed by the action model. Again, this is done in a closed form. The prior is shaped by the gradient (Jacobian) of the transition function with respect to the state at the mean of the state prior and action. Process noise is added to the resulting posterior. If the action is provided as a distribution, then the gradient of the transition function with respect to the action is used to tranform the action mean into action noise which is also added to the posterior. DifferentialDriveAction model provides the left and right velocities and the time period over which to apply the control. Implementations for these Jacobians are provided by DifferentialDriveActionModel. The following Silverlight app shows the state Jacobian in red and the action Jacobian in blue (note that for simplicity of visualization, the heading component is not displayed). The state transtion component mostly affects how far to the left and right the robot's path may vary. The action transition affects only the distance traveled by the robot. The action Jacobian is singular. It projects any action error onto a line along the robot's direction of travel. ExtendedKalmanFilter requires its action model to be an ExtendedKalmanActionModel. ExtendedKalmanActionModel defines the methods that provide the state and action Jacobians. DDActionModel implements this interface with the actual implementations for the Jacobian function derived from DifferentialDriveActionModel. The code for the EKF action model follows. The code to set up the filter is very similar to that of the Kalman filter. The code to update the belief is simpler than that of the Kalman filter. The sensor update uses the same linearization technique in the EKF. However, for this tutorial, we will use the same sensor model as we did with the Kalman filter. The code for the EKF sensor model follows. The sensor update code is exactly the same as the Kalman filter. Once again, a Silverlight app demonstrating the EKF in action is below.